search.mytelevisionxp.com is the PUP that uses misleading techniques to prevent removal. Use Reimage to locate malicious components and get rid of them faster than with uninstall instructions. A full system scan blocks virus reappearance and prevents traffic to malicious domains. How can search.mytelevisionxp.com hijack my computer? How to remove search.mytelevisionxp.com virus? Even though search.mytelevisionxp.com is not malicious on its own sense, it is categorized as a ‘browser hijacker’ and a ‘potentially unwanted program’ (PUP). That’s because it initiates unauthorized browser’s modifications and starts various marketing campaigns no matter whether users want that or not. Be careful and avoid browsing the net using this search provider because it is may deliver altered search results filled with links to affiliate websites that you may not only do not want to visiting but even should avoid visiting due to questionable content. In addition to that, search.mytelevisionxp.com virus is blamed for spying on its users. It has been noted that it may install tracking cookies and monitor users’ search terms, mostly visited websites, clicks, IP address, PC’s location, email address, clicks and similar personally non-identifiable information that may later be used for such unfair purposes as email spamming or misleading advertising. Finally, search.mytelevisionxp.com redirect virus may be the reason of your web browser’s slowdowns, crashes, and freezes, so you are strongly advised not to keep it installed any longer. Since it’s not clear what third parties support this search, there is no chance of knowing whether reliable websites are promoted or not. At best, you should remove search.mytelevisionxp.com virus along with My Television XP app once and for all using a reliable anti-spyware, such as Reimage. search.mytelevisionxp.com hijack is caused by My Television XP browser plug-in. It can be downloaded from the official website as a legit tool for watching TV on your computer. Nevertheless, this app may also be promoted via other freewares/sharewares, which is a much trickier way to spread potentially unwanted programs. We say ‘trickier’ because ‘optional components’ that are spreading around with freewares are typically installed by default and uswers do not even notice them. 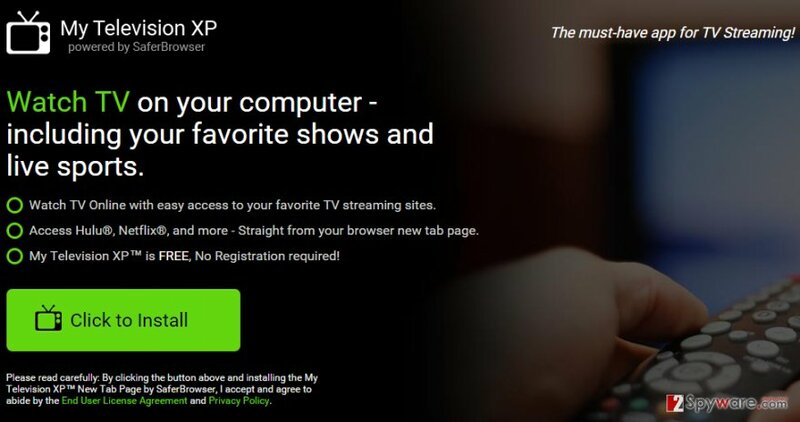 Therefore, if you want to prevent unwanted search.mytelevisionxp.com redirects from exposing you to unfamiliar websites, you should check what components your selected freeware is carrying. For that, opt for Advanced/Custom installation mode and read all the terms step-by-step. Finally,our recommendation would be to opt out of all additional components because most of them are nothing else than adwares or browser hijackers. 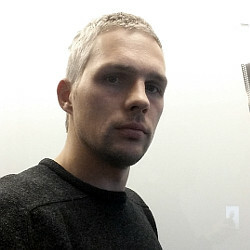 Browser hijackers commonly infiltrate computers along with other potentially unwanted programs or may help other suspicious apps infiltrate your machine. Therefore, in order to remove search.mytelevisionxp.com along with all its components, we recommend using a reliable anti-malware. Here, look for search.mytelevisionxp.com or any other recently installed suspicious programs. Wait until you see Applications folder and look for search.mytelevisionxp.com or any other suspicious programs on it. Now right click on every of such entries and select Move to Trash. When in the new window, check Delete personal settings and select Reset again to complete search.mytelevisionxp.com removal. Once these steps are finished, search.mytelevisionxp.com should be removed from your Microsoft Edge browser. Here, select search.mytelevisionxp.com and other questionable plugins. Click Remove to delete these entries. Now you will see Reset Firefox to its default state message with Reset Firefox button. Click this button for several times and complete search.mytelevisionxp.com removal. Here, select search.mytelevisionxp.com and other malicious plugins and select trash icon to delete these entries. Click Reset to confirm this action and complete search.mytelevisionxp.com removal. Here, select Extensions and look for search.mytelevisionxp.com or other suspicious entries. Click on the Uninstall button to get rid each of them. Here, look at the Homepage field. If it was altered by search.mytelevisionxp.com, remove unwanted link and enter the one that you want to use for your searches. Remember to include the "http://" before typing in the address of the page. Now you will see a detailed dialog window filled with reset options. All of those options are usually checked, but you can specify which of them you want to reset. Click the Reset button to complete search.mytelevisionxp.com removal process. This entry was posted on 2015-09-17 at 23:12 and is filed under Stealing programs, Viruses. You can quickly scan the QR code with your mobile device and have search.mytelevisionxp.com redirect manual removal instructions right in your pocket. How did you remove search.mytelevisionxp.com redirect?